If you want to list your boat or equipment for sale, or make an equiry about an item, please contact us. If you are looking for or offering yourself as a crew or helm then the best place is to join our facebook group or again please use the contact us page. 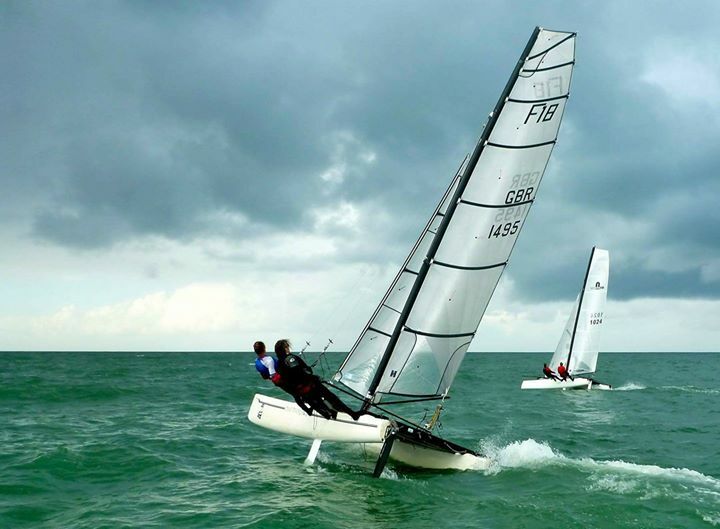 Hobie Tiger F18 – £SOLD. The lightest and fastest Tiger in the 2017 F18 Worlds for sale. Almost min weight at 180.5kg all up. Excellent sails. New mast 4 years ago. Black carbon rudders. Tapered main sheets. Dynena trapeze lines and bridle. 10:1 downhaul. 10:1 main blocks. Smart blocks on spinny. Every racing tweak we can think of us on this boat. Comes with 2 jibs , 2 spinnys, awesome main, full hobie boat cover and fat wheel launch trolley. Happy to help with delivery. Apart from the hulls it’s a 5 year old boat.